In a recent post we discussed how content marketing needs to be viewed and valued as a strategic business activity (7 Ways Content Marketing Drives Revenue Growth). HubSpot's recent demand generation report found that organizations exceeding their revenue goals were more likely to use content creation, online advertising and branding/public relations marketing tactics, with content creation leading the pack by a substantial lead. With buyer behavior evolving, increasing numbers of people now start their search for products and services by looking for information online. So in order for businesses to generate real growth and compete online, they need to have a digital marketing strategy which includes a well planned content marketing component. But don't just jump into content marketing unless you are ready to fully embrace the value it can add, the long term gains and are prepared to commit the time and ongoing resources required to make it successful. There's a lot more to content marketing than just writing some blog posts. We've written many many times about the importance of knowing your target audience. If you're going to write content to address their needs, you need to know as much as possible about them. If you don't know about their goals, challenges, common objections, communication preferences etc then how will you know what content you need to create to add value and address these needs as they move through the buying process (buyers journey)? A Buyer Persona is a fictional representation of your ideal customer. Having well defined Buyer Personas is critical and these are one of the most important assets in your marketing arsenal. Personas should be used to create unique content that speaks directly to and resonates with your ideal audience to help them with their challenges. then make them SMART, and use them as a basis for creating your content marketing strategy. Start with your business goals like 'increase revenue by 20% in 2018" and agree how much marketing are going to need to contribute to that goal. Then break it down further and work out what your content marketing goals need to be month on month to hit that business goal. Set smaller monthly goals you need to achieve in order to hit the end of year goal and measure monthly to keep track of progress and tweak as required. Check out our recent post Why SMART Marketing Goals Set You Up for Success for more insights into SMART goals and how to set them. Share these goals with your executive team, sales teams, customer service teams and any other departments that may benefit. After all you should be working as a team and the content that you create can be used by all of them throughout the sales process and to help with customer support and retention. You must meet the needs of your target audience with your content at each stage of the buyers journey (sales cycle). 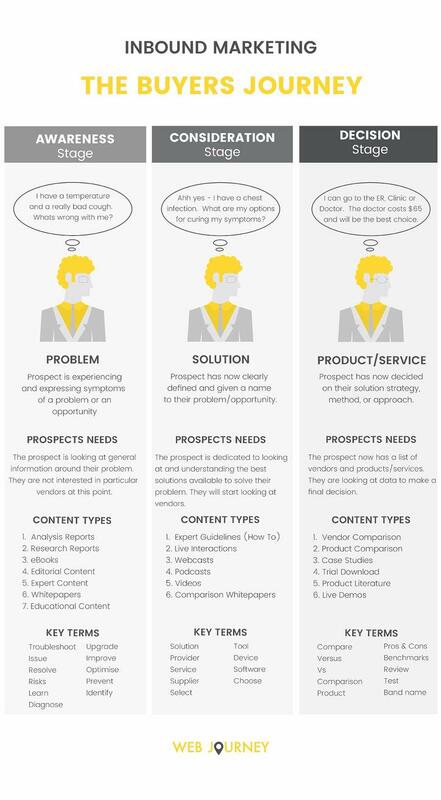 Below are the 3 key stages buyers go through, their needs and the types of content that can be mapped to each stage along with some of the key terms or buzzwords they are likely to use. If you want to learn more about the buyers journey and how various types of content fit in then check out our post Sharpen your Marketing Campaigns by Following the Buyers Journey. Now that you have SMART goals, you understand your buyer personas and what stages they go through in the buyers journey, you need to put together a content strategy and a plan to implement it. So keep these in mind when putting together your content plan. Map all content to pain points/challenges/interests that you have identified in your buyer personas. Plan premium content offers with blog posts to promote them for each persona and stage of the buyers journey. The frequency with which you will need to produce these will depend on your goals. When planning blog posts for your premium content offers like eBooks and Guides, map out low difficulty keywords that your buyers may be using to search for information and write blog posts around these. There's no point in creating content if you don't promote it. Use the channels identified in your buyer personas to get the content out to them. If you write good evergreen content you can continue to promote it, even a year later it may still be relevant and helpful to your target audience. Use paid channels to further promote high-performing content or high value assets like detailed guides, eBooks etc to get the most from them. Include social share buttons on Blogs, Landing Pages, Emails etc. These are a essential so that people who find your content valuable can share them with their audience, peers and wider networks. For more tips on how to best promote your content, then take a look at 12 Effective Content Distribution and Promotion Tactics. At a minimum, make sure email marketing and social media are key areas of focus. If you have set SMART marketing goals and have identified the metrics you are going to use to measure your success, you will quickly be able to learn what is resonating with your audience and tweak your content based on these results. You should be able to consistently improve your overall marketing results and ROI if you do this regularly. A significant benefit of content marketing is that it helps businesses prepare and plan for reliable and cost-effective sources of website traffic and new leads. Content can continue to generate leads over time - even a year later, so having a content marketing strategy in place is a wise investment and worth all the effort you put into it. If you're planning your budgets for 2018 and need a benchmark, on average, B2B marketers allocate 28% of their total marketing budget to content marketing [Source: CMI]. 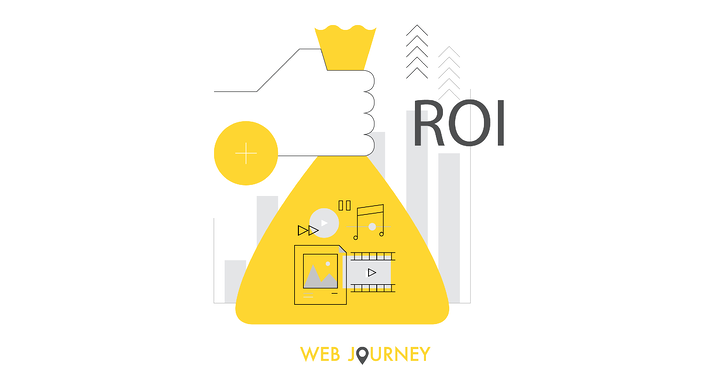 But make sure you give yourself the best chance of success and make sure you use all of these ways to Improve the ROI of your Content Marketing. If you're just starting out then you will be off to a solid start! If you need help working out your goals then download our free marketing goals template below. Alternatively, if you would like to discuss your content marketing strategy or need any advice on how to improve results, feel free to contact me at sinead@webjourney.ie.